WASHINGTON, D.C. -- Gallup's initial measure of consumers' 2017 Christmas shopping plans suggests retailers could see the best holiday sales in years. 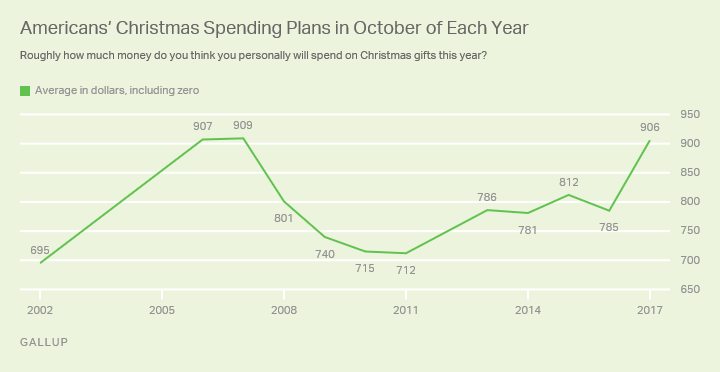 The chief indicator is a sharp increase in the amount Americans say they plan to spend on Christmas gifts -- now $906, up from $785 in October 2016. 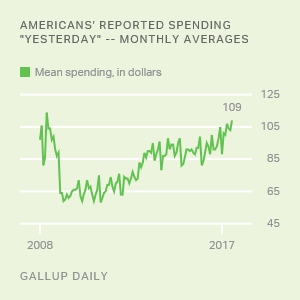 That represents one of the biggest year-over-year increases in Gallup's trend, pushing the spending projection to its highest level in a decade. More specifically, 34% of Americans plan to spend at least $1,000 on Christmas gifts this year, 23% say they will spend between $500 and $999, 28% expect to spend between $100 and $499, and 3% will spend less than $100. 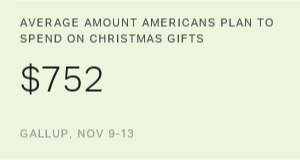 Six percent of U.S. adults report that they won't spend anything on Christmas gifts, which includes those who say they don't celebrate the holiday. This year's $121 increase in Americans' average holiday spending projection cannot be converted into a precise percentage-change forecast; however, analysis of Gallup trends finds that big year-over-year increases, such as the one seen this year, are typically associated with strong holiday shopping seasons. In addition to Americans' strong projection for their outlay on gifts, consumers are exhibiting an unusual willingness to admit that their overall spending will be on par with or higher than a year ago. When asked to say how their expected spending compares with last year, a record-low 16% say they will spend less and 17% say they will spend more. As is typical, the largest share, now 65%, say their spending will be about the same. However, this is the first year since 2000 that roughly equal percentages plan to spend more vs. less. More often, a much higher proportion of consumers have said they plan to spend less rather than more. Consumers' relative enthusiasm for holiday shopping this year is most evident among middle- and lower-income adults, but it will be important to see if this holds up in subsequent Gallup measures as the season progresses. Although partisanship affects lots of attitudes these days, there is no difference between Republicans and Democrats in the year-over-year change in spending intentions. Republicans typically report spending more on gifts than Democrats do, and that continues, but both groups' estimate is up by about $100 over last year. Analysis by the National Retail Federation shows that holiday sales have posted gains of less than 4% in four of the past five years. Only in 2014 did sales outpace that, reaching 5% growth. Gallup's initial measure of consumers' 2017 holiday shopping plans -- which doesn't distinguish between traditional and online purchases -- suggests spending could match or exceed the recent high-water mark. However, caution is warranted, as Americans' spending intentions often change as the season progresses. 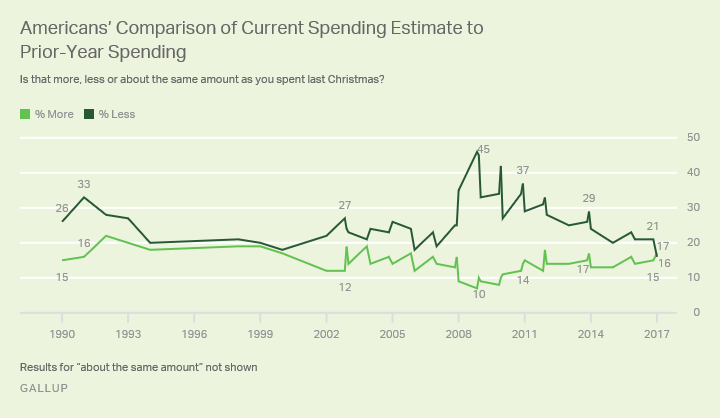 Gallup will provide a second update on holiday spending intentions in mid-November. Numerous factors likely go into the delicate psychology that determines whether consumers feel comfortable draining their checking accounts or swelling their credit card balances in order to stuff the space under the tree with presents. In addition to their own personal financial situation, those could include national economic metrics such as stock market and unemployment reports, as well as policy actions out of Washington, particularly as it relates to the federal budget and taxes. Results for this Gallup poll are based on telephone interviews conducted Oct. 5-11, 2017, with a random sample of 1,028 adults, aged 18 and older, living in all 50 U.S. states and the District of Columbia. For results based on the total sample of national adults, the margin of sampling error is ±4 percentage points at the 95% confidence level. For spending, the margin of error for results based on the total sample of national adults is ±$68 at the 95% confidence level. All reported margins of sampling error include computed design effects for weighting. Americans anticipate spending $785 on Christmas gifts this year, consistent with their estimates since 2013. Nearly nine in 10 U.S. adults intend to spend something. Americans' estimate of the amount they will spend on gifts this holiday season matches the average since 2010.